These are straight from the mould without any clean-up so far – but they don’t need much, just clip off the little bits of sprue and run a file quickly round the rough edges. We’re aiming for a release this weekend; I’m hoping to slap some paint on them first, but even if that doesn’t happen they’ll be on the website and up for sale by Monday morning, which means of course that you’ll be able to take advantage of the Xmas sale. As mentioned earlier this week, we’re working on a new range of buildings for our Land Ironclads VSF range. The buildings are all modelled at 1/1000th scale so besides Land Ironclads they are also ideal for 2mm or 1/1200th vehicles and figures. Besides the churches and houses previewed in the earlier post, I’ve already modelled a number of other buildings which you can see below. The first set, already complete, are agricultural buildings – farmhouses, barns, sheds, windmills and – very common in the Kent countryside around Brigade HQ – oast houses (there’s one at the end of my road, now used as an office building). The next set consists of a number of industrial buildings – small and large factories, warehouses, a pumping station, workshops, even a hydro-electric power station. The four rather imposing smoke-stacks tower over the tiny houses, and all four are interchangeable if you want to customise the look of the buildings. The third set is a series of terraced houses for more urban landscapes. There are four designs, and other slight differences between some of them. Often associated with Northern England, terraces of this type are also seen in abundance in the south of the country (all of them are based on terraces in our local area). All three sets have been ordered from the printer and are due in the next few days. Because we order them in sets that fill a complete production mould there is no intermediate master-mould stage and we should be able to get these into production quite quickly. The models are the same – we have a set of 20 English village buildings (mostly houses, with the odd inn, pub or shop amongst them) and nine two-part churches. The nine towers will fit any of the three naves, allowing for plenty of variation. Because we’ve made enough prints to completely fill two moulds, we should be able to release these in double quick-time because we can bypass the intermediate master-mould stage and go straight to production moulds (the original hope was that we’d have these for SELWG, but that didn’t happen). The houses will come in a single pack of 20 houses for around £5, while the churches will be in a pack of three (one of each nave and three random towers/spires) for £3. 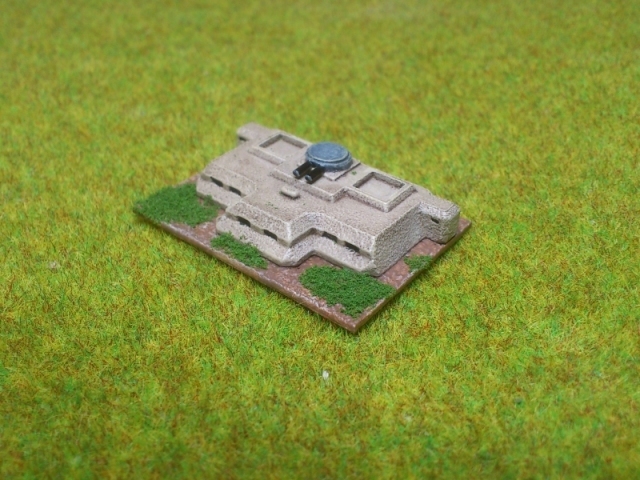 The successful printing of these also gives us the confidence to go ahead and order more buildings – we have farms, factories and terraced houses ready to go and lately I’ve been working on some Mediterranean buildings as a break from 15mm tanks. I’ll preview some of these later in the week. 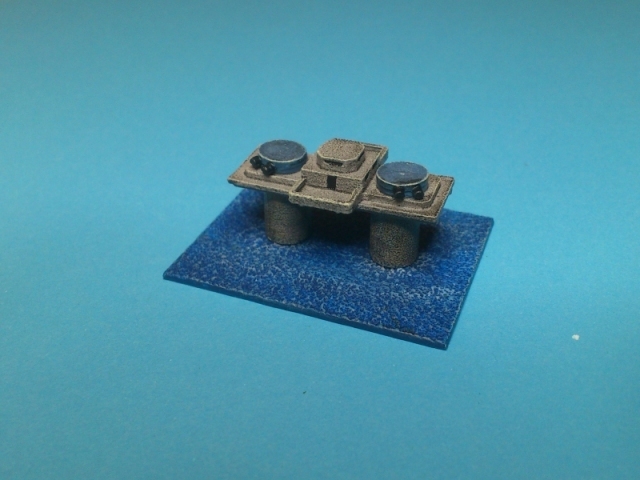 As mentioned in a recent post, we’re planning to expand our range of 2mm scenery as part of the Land Ironclads range. To this end, we were rather excited when a bunch of 3D prints arrived the other week. The first batch consisted of 20 different English village buildings – mostly houses, with the odd inn and shop thrown in for good measure. Each building is unique, so it will allow you to build a largish village or maybe two small hamlets without any repetition. The second batch was nine English churches in various styles. The larger size meant that I had to model the towers separately from the naves, so I took the opportunity to make a common join, which means that any of the tower designs will fit any of the three nave types. There are three main tower designs (crenelated tower, steeple, low-pitched roof) but each is slightly different, so it’s possible to make up to 27 unique church designs. More previews, this time of a couple of new Land Ironclads forts. These are variations on the existing Maunsell sea fort, one with a single turret and leg and the other a much larger four-turret fortress. We should have stocks of these for Crisis in a couple of weeks’ time. 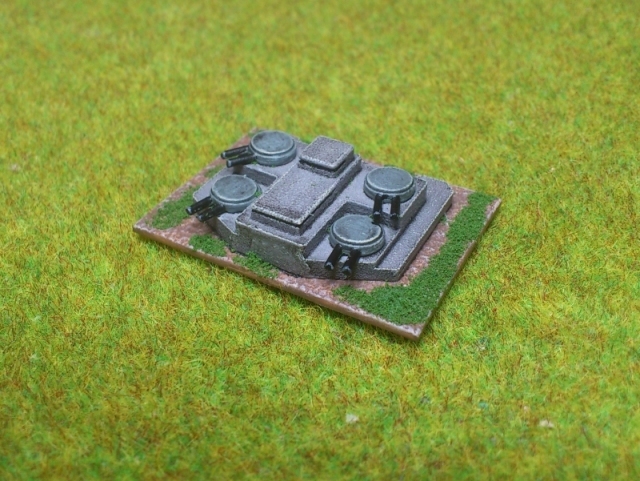 More previews today, this time of three fortifications for Land Ironclads or Aeronef. These models have already been moulded and we’re casting tins for a production mould – we’re aiming to release these at Salute in April. 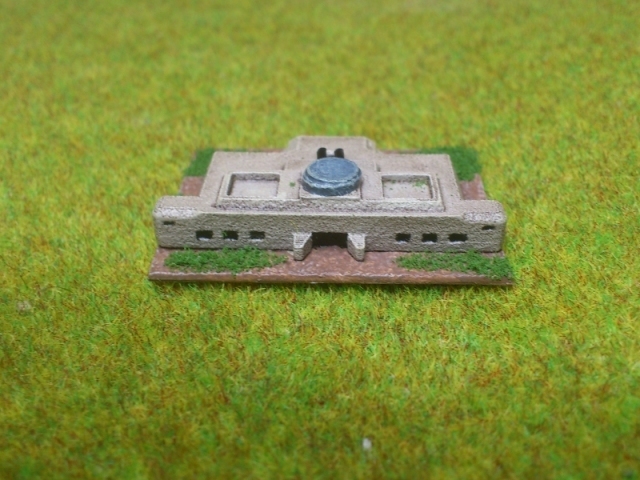 First up is a British tower fortification, based on the designs of the WW2 Maunsell Forts, some of which are still in place off the coasts of East Anglia and Kent. The 3.7″ AA guns on the real thing have been replaced by a pair of our standard British Aeronef turrets for more firepower ! Although designed as a sea fort, the design would look perfectly at home on land as well. 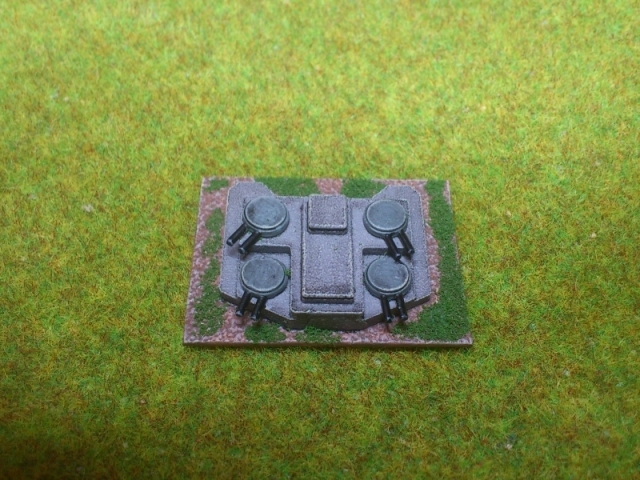 Last up, and based on what I think is an image from a between-the-wars toy building set (which I can’t now find), is a strongpoint with a single turret and plenty of firing slits for emplaced infantry. If you followed this blog you’ll know that we, like many other miniatures companies out there, have started using 3D computer modelling and printing as an aid to the design of some of our models. So far we’ve used it to produce masters of models that are still produced the old-fashioned way by hand-casting in metal or resin. Mass-produced 3D printing of all of our products isn’t here yet, speed and cost of production remaining barriers to be overcome. However, there are still advantages that it offers in terms of producing complex models that would be nearly impossible with traditional techniques. For example, models which are hollow or have significant undercuts, holes or insets can be printed in one piece without the need for complicated or fiddly multi-part designs that are difficult to assemble and delicate when on the gaming table. To that end, we’ve launched our own fledgling shop on Shapeways, which we will use to offer models that we would find difficult or impossible to offer in the normal way. We will also offer a few pieces that we would like to produce, but that we suspect may not have mass appeal and thus would not justify the cost and effort of making masters and moulds. 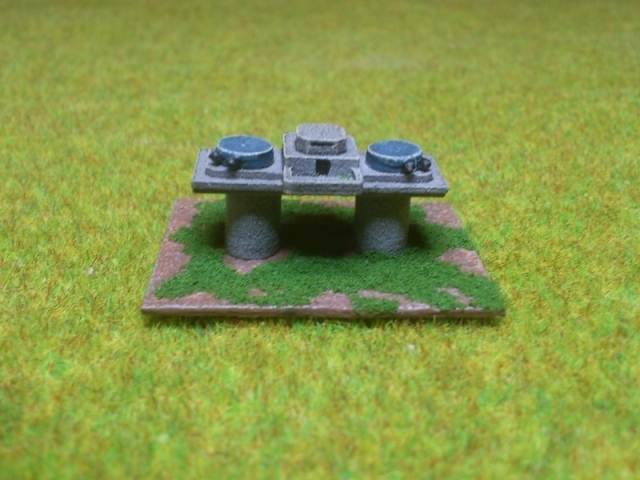 We’ll also be tackling subjects outside of our normal ranges (such as my current 6mm WW2 project). The initial range of models is quite small – but that’s because we want to get a prototype of each model printed for ourselves first, so we can make sure it all works OK and looks good. We’re hoping to regularly add new items as we design them and can get prototype prints.